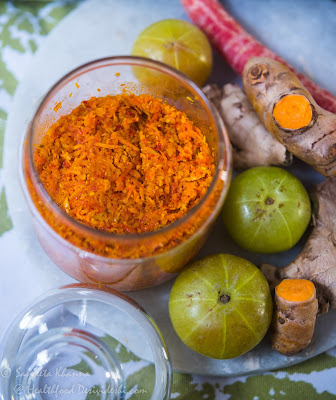 Making pickles is an interesting way to eat small portions of some of the desi superfoods you want to include in your everyday meals but they are not as tasty as you would like them to be. 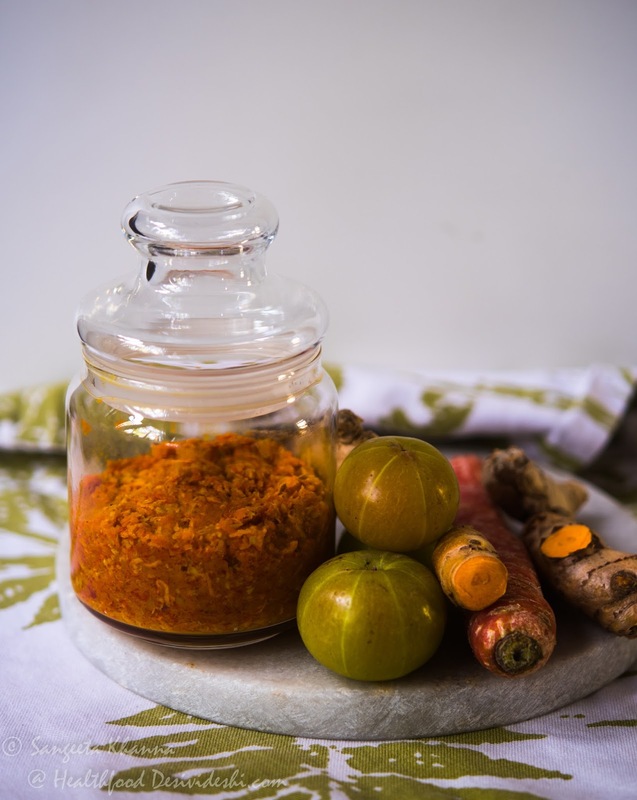 You would remember the Amla pickle, Amla chutney, Amla chokha, Amla in brine and the Amla and raw turmeric pickle that I make, but one needs some thrill of eating a new pickle made of the same old ingredients. You agree? So I am not a pickle eater normally, the Aam ka achar and mirch ka achar are consumed very rarely and that too when we have guests over but the quick pickles made in small batches are my favourites. I often add them over my salads and even make some nifty salad dressings with them too sometimes. You just can’t let that zesty tangy goodness not be a part of at least one meal a day. I thought of this kuchla style pickle when I was shopping for my weekly vegetables. The fresh shiny amlas and plump fresh turmeric reminded me of the Amla Haldi Adrak ka achar I make but this time I wanted something different. I wanted the pickle to be so simple that one can use it in many other ways too. Once the kuchla style (made with grated ingredients) amla turmeric pickle was ready, I made a tangy vegan mayonnaise with it and a salad dressing too. Then I added this to a raita and applied it on my sourdough roti wraps that become a quick working lunch. You get the idea why keeping the pickle simple goes a long way in its utility. Using the finer side of a box grater, grate (shred) the carrot, amlas, turmeric and ginger. You may want to scrape the skin of carrot, turmeric and ginger but I just remove the deep eyes from the surface and wash them clean. Removing the deep crevices from the root vegetables ensures there are no pathogens stuck in it. Transfer the shredded mix to a deep bowl, add salt and chilli powder, pour the oil and mix thoroughly using a spoon or fork. Transfer to a sterilised glass jar and press down the pickle so the water released by the action of salt bathes the pickle completely. This prevents any fungal contamination. The pickle keeps well for months at room temperature if you use a dry spoon to scoop out the required quantity and make sure you press down the remaining pickle every time. You can make this pickle without the carrots too, but carrots help balance the flavours I felt. The second batch I made without the carrots was a bit too sharp for my liking. Replace the carrot with similar amount of amla if needed. If you are concerned about the excess salt, you can keep the salt lesser but make smaller batches of the pickle as it will stay for about a week or so. Making smaller but frequent batches works best as this pickle tastes the best for a couple of weeks. It tastes good all through the year if you maintain a layer of oil over the surface so do that if making a big batch or you want to gift it to someone. So good to hear from you. You can use raw mango if you don't get amla. Thank you so much.